Most of us love the fall season. The weather starts to turn just a little cooler, and the leaves on the trees begin to shed. 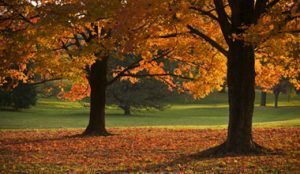 While these falling leaves are picture-perfect, they easily become an annoyance to homeowners trying to keep their lawns tidy. Luckily, homeowners have options. Besides tossing the leaves in the garbage, you have more useful options at your disposal. One of the primary reasons that leaves fall to the ground each year is to effectively suppress competing plants around the roots of the tree. This mess of dead leaves contains a high concentration of nutrients, though. If you turn the bunch into mulch, your garden should grow brighter and healthier! Creating a compost pile takes time and work, but it effectively utilizes the nutrients found in dead leaves to their fullest. Shred the leaves first, mix in a few greens, and watch as decomposition sets in. You’ll then have nutritious soil for your plants and garden. If you have space for chickens in your yard, creating chicken bedding using fallen leaves is an ideal method to keep your yard clean. Gather the leaves in a large trash bag, allowing them to decompose over time. Lay the remnants in the chicken yard. Wherever possible, try to avoid using a leaf blower. While effective in some instances, they’re typically loud and create noise pollution. Instead, choose a rake. A rake doesn’t fling dead leaves across the lawn, creating more work. We know; most homeowners want a fresh, tidy yard. However, letting leaves remain where they fall is a natural process. In fact, doing so allows butterfly and moth species to populate. To schedule lawn care service, contact Blooms Landcare by calling (817) 688-5352. We’re here to handle your lawn. In fact, we’ll ensure it’s healthy and efficient! Previous Previous post: Tree Trimming vs. Tree Pruning — What’s the Difference?